2016 marks the 97th national celebration of Children’s Book Week, the longest-running national literacy initiative in the country! Already featured in USA Today, Children’s Book Week connects young readers with authors and illustrators at official events hosted in 50 states during the week of May 2nd through 8th. Storytellers bring books to life through live performance. Author Michele Gerber reads her book Pieces and Parts followed by a self-portrait collage activity. These events are open to the public and ALL attendees will receive a complimentary Children’s Book Week poster and tote bag (while supplies last). 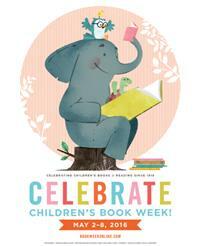 Children's Book Week is administered by Every Child a Reader and sponsored by the Children's Book Council.